Jews | Did you learn anything? Last week, I Facebook-liked a news item about an acquaintance of mine, Y., giving birth. The reason this was national news in Israel is that Y. identifies himself as a male. The article respected this, using the male gender even on the verb for “gave birth”. Two other acquaintances of mine made snide comments on Facebook, culminating in “it’s like they’re trying really hard to show that it’s actually a man who gave birth”. 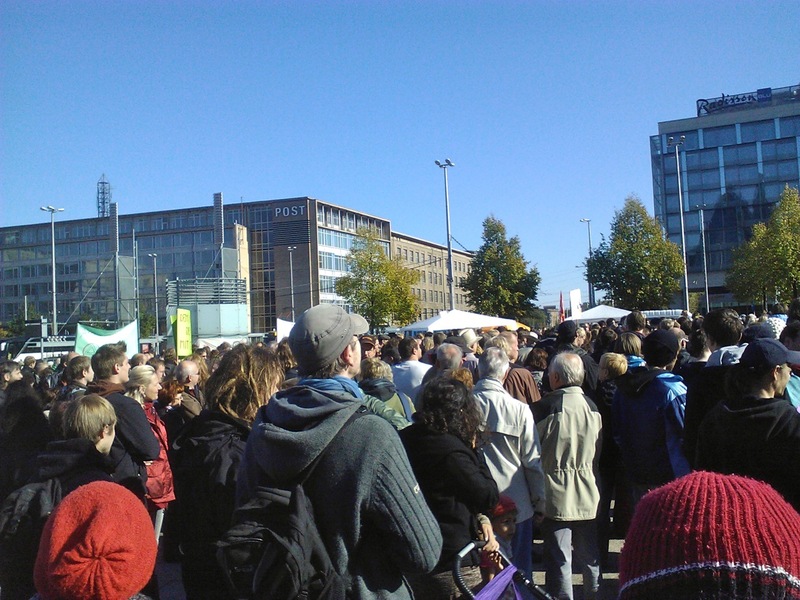 I just got back from Leipzig’s #globalchange festival/demonstration. At one point, I noticed two guys holding up an Israeli flag, and went over to ask what that’s about. It was the only national flag present and I wasn’t sure what it was doing there. “We’re here to provoke,” said one of the guys. “This demonstration is structurally anti-Semitic.” The idea, of course, is that a demonstration with anti-elite, anti-banker sentiment is anti-Semitic, whether the demonstrators know it or not. I tried to argue against this odd rhetoric, but he quickly said he doesn’t want to discuss it. These counter-demonstrators are, I gather, anti-Germans. This is a movement considered to be left-wing and anti-fascistic, with a commitment to unconditional solidarity with Israel. The paradox of the “provocation” I witnessed is that this was the only mention of the “banking=Jews” stereotype I could detect in today’s demonstration, or indeed in all of the Real Democracy Now activities that led up to it in the past half year. It seems to me like the anti-Germans were the only ones bringing anti-Semitism into the demonstration. It annoys me to no end that they weren’t open to discussion, and this post is my attempt to say what I would have told them if they were willing to listen. Historically, rulers and ruling elites have used anti-Jewish sentiments to deflect the anger of the oppressed masses towards a relatively powerless group (Jews). In a way, it comes down to rulers explicitly or implicitly fostering the belief that the Jews, not the rulers themselves, are the problem. What those anti-Germans were trying to do today was the same in reverse – delegitimizing an expression of legitimate grievance against the ruling class by claiming it’s an illegitimate expression of intolerance against Jews. This makes me pretty angry, I have to say. If I had detected any anti-Semitic sentiment or rhetoric from the demonstrators, I would go berserk. But I felt very comfortable at the demonstration, felt it was a matter of global solidarity, explicitly inclusive to me (with my irrelevant Jewish background) and to anyone else. The first thing that made me uncomfortable there was the anti-Germans with that big Israeli flag. How dare they insinuate that the German banking system is controlled by Jews? Where the heck did they get that idea? You know what, I don’t actually know the names and backgrounds of any major German bankers. And I don’t need to. We were demonstrating against the absurd situation in which Europe and the world are in crisis yet the number of millionaires in Germany has only increased. We were demonstrating because we’re told things are going to get hard and we have to live in fear of economic collapse while those who were involved in creating this mess have nothing to fear and they continue to control much more wealth than the rest of us. Even if it so happened that 99% of German bank owners are Jewish, this wouldn’t have been an anti-Semitic demonstration. Speaking out against someone who happens to be a Jew is not anti-Semitism. Speaking out against “the Jews” or attacking someone because they’re a Jew is anti-Semitism. Is those anti-Germans’ approach supposed to somehow protect Germany from a resurgence of anti-Semitism? Seems to me like at the very least, it muddies the waters and creates confusion about what is or isn’t anti-Semitic, making it easier for real intolerance to fly in under the radar. Even worse, it can actually re-enforce anti-Semitism by suggesting that speaking out against the powers that be is speaking out against Jews – supporting the false equation that “(the) Jews” are responsible for the power structures we live within. There. I think I got it out of my system now. Has anyone else encountered similar situations, where people meaning to fight intolerance end up implicitly encouraging it? Guy Bechor, while exemplifying the legitimate fears of Israelis and Jews, writes a confused mess, seemingly sent from some mythical world invented by 20th-century European fascists. Deep breaths. I just finished reading an article on Ynet, by Guy Bechor, titled “A Middle Eastern lesson“; it was shared by Peace Now on Facebook to “give insight to Israeli fears”. That it does. It also gives insight into a romantic populist world-view, forged of myth and nationalism, in which countries are populated not by people, but by peoples (German: Völker), embodied by their leaders (German: Führer). And while writing this imaginative nonsense, he manages to call those who would strive for peace “gullible”. Deep breaths. Bechor begins with a fable of Aesop’s… Something about wolves and sheep and dogs. This is a good way to start, as it puts the reader in exactly the mindset needed to believe Bechor’s hysteria. There are three kinds of players in Bechor’s world: the wolves, who are really bad, the sheep, who are just helpless, and the dogs, who are not wolves and no simple sheep, but can at least defend themselves. Having set the stage, we now go on to discuss the actual complex realities of one of the most politically difficult regions currently to be found on our planet. Except there are no complex realities, since Bechor is so much more intelligent than us morons. Allow the genius to teach us the ways of the Middle East: it boils down to Arabs being brutal and violent, and Jews and Christians having to create heavily-armed nation-states to defend themselves. I kid you not, ladies and gentlemen! At last, Bechor has revealed to us the simplicity of the Middle East, and there it is, in one sentence! Thank me later. Facts, of course, are irrelevant. In Bechor’s world, things are simpler, and more fantastic. In Bechor’s world, Christians are being “butchered” in post-revolution Tunisia and Egypt (citation needed). In Bechor’s world, what’s happening in Syria is about Arabs killing minorities. There is no context, there are no politics to speak of, just a people being evil. What Bechor does here is, to me, an immense sin. Like certain Führers of times gone by, Bechor sees the world as composed of peoples, acting as united wholes. There are Arabs, there are Christians, there are Jews. Wolves, sheep, and dogs (his words, not mine). Never mind that someone can be an Arab and Christian at the same time, that kind of complexity is incompatible with this simple, simple world. It is divided into nations, these nations are in some kind of eternal struggle, and, hence, they need armies. End of story. What’s worse, when it comes down to choosing who represents these nations, again Bechor sides with evil. It is the Assads and the Mubaraks and the Ghaddafis and the Ben Alis, and their paid thugs, who show Bechor’s “true Middle East” — not the masses of people, oppressed by those asshats for decades, who finally take to the streets, put their lives on the line, and demand their freedom. Not the soldiers and officers who defect or desert when ordered to fire on civilians. No, the Führer is the nation, and the people must follow. Excuse me while I throw up. […] outside elements – and to my regret domestic elements as well – try to weaken the IDF via needless commissions of inquiry, incitement and criticism, propaganda, and an effort to taint the army’s moral prestige. I don’t know, Guy, don’t you think the army’s moral prestige might also be tainted by soldiers trashing houses, systematically humiliating civilians and prisoners as a kind of sport then (sometimes) posting photos on Facebook, or firing white phosphorous on residential neighborhoods? Don’t you think that being put in the position of policing an occupied, largely civilian population, with mainly just combat training as preparation, might be having some ill effects on the army’s morality as well? Don’t you think commissions of inquiry might help make sure soldiers stick to the IDF’s moral code, and incidentally increase its moral prestige by proving it can take scrutiny? And most of all, is a reputation for morality really more important than actual moral behavior? The Middle East is a difficult place to be. Bechor is right in that the dictators’ response to the Arab Spring is revealing. It reveals the dictators’ true colors to anyone who had a doubt. Yet the revolutions themselves are revealing a reality that should have been clear, but is clearly lost on Bechor and his ilk: the Führer ist not the Volk. The people under dictatorship are not represented by their so-called “leaders” — they are their victims. Rivers of blood flow through the Middle East, as usual. This is a difficult time, and even more difficult is to guess what comes next. But the basic and obvious reality — one which I’ve incidentally heard from at least two Arabs I’ve spoken with here in Germany — is that peace is in everyone’s best interest. Most Israelis know it, on some level. Most Arabs know it on some level. And finally, we may just see some governments in the Middle East which strive for everyone’s best interest, and not just the interests of the dictators and the elites behind them. After my previous guest post Beware: Adult Content generated a high volume of traffic to Michael’s blog, he invited me back, and I will be contributing occasionally (even though we both know what really drove the traffic surge were the key words “adult content”). As I end my visit to Leipzig I offer you a piece I wrote during a previous visit two years ago. It is long. I am ushered to a downstairs room in the beauty salon. The manicurist, walking a step behind me, says something in German about “links.” My mind flashes straight to Dr. Mengele on the platform. Links – left –means life. Rechts – right – means death. She wants me to take the seat on the left, I realize. I sit down.